Sensory reality. The name maybe already says it all; during a simulation in a virtual world, all your senses are being stimulated. That means that you can walk down the beach while hearing kids play, smelling the salty water and feeling a breeze. These kinds of simulations are carried out through a virtual reality glasses, like the Oculus Rift. Therefore, it is not a surprise that Christel Tuin from tech magazine Computable calls sensory reality the new virtual reality; sensory reality is not only an audio-visual experience, but impacts all the senses at the same time on top of that. High Tech Campus in Eindhoven brings sensory reality in relation to virtual reality as well by calling the sensory reality the big brother of the latter one. Despite the fact that sensory reality now merely looks like a technology that improved virtual reality, it is so much more than that. Sensiks, the corporation behind the technology, proves that sensory reality has the potential to not only improve a virtual world, but also the physical world of disabled people in health care facilities for example. People who are not any longer able to go outside, or do things, can now go into the sensory reality Pod and experience a day on the beach or in the forest without needing to go outside. Because all the senses are stimulated, your brain will think that you actually were at those places, which results in stress reduction and an euphoric state of mind. That these kind of results can be obtained through a technology sounds promising, but when one searches on sensory reality it becomes clear that we are talking about a very emergent technology; it is so new that there is hardly written about the object and it’s outcomes. However, a few tech platforms like the ones that are mentioned before started writing about it, and since they all bring it in relation to virtual reality it may be evident that sensory reality’s background lies in virtual reality. Although it seems that virtual reality is mainly being discussed and used in the past decade, scholars like Rheingold already wrote about it in 1991: “[…] how might we use it to help us make plans, imagine, and otherwise exert conscious influence on an increasingly complex environment? Can we imagine ways to apply it to the very real problems of the world?” (391). It is interesting to see that virtual reality already was a topic of discussion back then, and that people like Rheingold were looking into the possibilities of the technology. Moreover, he was asking himself if we could imagine ways to apply it to the very real problems of the world, which virtual and sensory reality nowadays kind of do. Chan wrote as well about the question how virtual reality could play a role in our lives on a daily basis, because; “[…] our engagement with technology is altering our sense of embodiment and how we experience the world around us” (9). George Beall from The Next Web continues that discussion by writing about how virtual reality and artificial intelligence are changing life experiences; he describes for instance how the integration of virtual reality for exhibits and museums is advancing. However, the developments in this field are way more extensive than just being able to improve museum experiences; media scholars like Russell, Dublon and Paradiso for example spoke about networked sensory prosthetics through auditory augmented reality, which means that they presented devices that let the virtual and physical world interact with each other (1). Wang et al. connected those worlds as well, but they did it on a whole different level; they brought eye-tracking into virtual reality to train kids with autism, in this way those kids could learn to seek eye-contact, something which is really hard to do for people with autism. Differently said Wang et al. benefited the life of kids with autism by letting those kids apply what they learned in a virtual world in the physical world. 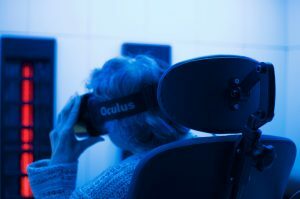 Sensory Reality does kind of the same by improving the quality of life of disabled people through virtual experiences. However, the main difference here is that sensory reality adds an extra layer by involving all your senses in the (learning) experience. This will activate your brain by letting it think that you actually were at those places, at the same time biometric sensors measure your heart rate variability, skin conduction and respiration. Thereafter, the cabin learns to know its user(s) through artificial intelligence and can give relevant content suggestions based on the actual mood of a persons and all collected data. The effects that can be achieved as a result of how this technology intertwines with artificial intelligence reach much further than only the simple interaction between virtual and physical worlds. The effects I’m talking about are related to debates about framings that imagine the digital in terms of epochal shifts or as redefining life, like Ruppert, Law and Savage discussed in their article about the reassemble of social science methods (1). They looked at the specificities of digital devices and how they interact, and sometimes compete, with older devices. Besides, they stress that they have the capacity to mobilize and materialize social and other relations. According to them, social science methods assemble digital devices and data to know those social and other relations, which is the reason for their exploration of the implications of digital devices and data for reassembling social science methods. Moreover, Ruppert, Law and Savage argue that digital devices are shaped by social worlds, and can in turn become agents that shape those worlds (ibid.). That is why they discussed the specificities of digital devices, because: “they are varied and composed of diverse socio-technical arrangements, and are enrolled in the creation of new knowledge spaces, institutions and actors” (Ruppert, Law and Savage, 1). Therefore, they emphasize the necessity of the material implication of digital devices in perceiving the production and performance of contemporary sociality. The relations I’m mentioning are about the ability of disabled people to communicate in new forms through the combination of sensory reality and artificial intelligence. The relevant content suggestions I talked about before could consist of emoticons based on someone’s mood, which opens up new ways of communicating for people who are not able to speak in a regular manner for instance. In this way sensory reality can transform the relationship between parents and their disabled kids who can only talk through emoticons produced by a device like sensory reality and the artificial intelligence that is integrated. This relates to what Ruppert, Law and Savage said before about digital devices shaping social worlds, and in turn become agents that shape those worlds; the world of parents and their disabled kids will be highly influenced and determined, since they are able to talk to each other through emoticons served by the technology. It may be clear that sensory reality in this manner is an improvement but not merely a displacement of virtual reality, something which Ruppert, Law and Savage mention as well: “[…] we have also argued that they often turn out to instantiate and reconstitute older practices, forms of stabilization and control” (ibid.). Briefly said, it does not help to see the digital in terms of epochal shifts or as redefining life; rather see it as an innovation in the virtual world within a virtual reality glasses, and perceive it at the same time as an enrichment of disabled people’s physical world. If we keep beholding this kind of approach in exploring the chains of relations and practices being enrolled in the social science apparatus, we need to vary the magnification of it (Ruppert, Law and Savage, 20). Beall, G. “How virtual reality and artificial intelligence are changing life experiences.” The Next Web. 8 August 2017. <https://thenextweb.com/contributors/ 2017/08/08/virtual-reality-artificial-intelligence-changing-life-experiences/#.tnw_j2ZTzY3C>. Chan, M. Virtual Reality: Representations in Contemporary Media / Melanie Chan. New York: Bloomsbury, 2014. Rheingold, H. Virtual Reality. Mono: Summit Books, 1991. Ruppert, E., Law, J. & Savage, M., 2013. Reassembling Social Science Methods: The Challenge of Digital Devices. Theory, Culture & Society, 30(4), 22–46. Russell, S., Dublon, G., Paradiso J. “HearThere: Networked Sensory Prosthetics Through Auditory Augmented Reality.” Proceedings of the 7th Augmented Human International Conference 2016 (2016): 1-8. Sensiks. 2016. Sensiks. 22 September 2017. <http://www.sensiks.com>. Sensiks. “SENSIKS. Sensory Reality Pods.” YouTube. 13 March 2017. 22 September 2017. <https://www.youtube.com/watch?v=GDrMrX3mobU&t=29s>. Tuin, Christel. “Sensory Reality Is Het Nieuwe Virtual Reality.” Computable. 2017. Computable. 22 September 2017. <https://www.computable.nl/artikel/nieuws/digital-innovation/6176314/250449/sensory-reality-is-het-nieuwe-virtual-reality.html>. Wang, X. et al. “Eye Contact Conditioning in Autistic Children Using Virtual Reality Technology.” Lecture Notes of the Institute for Computer Sciences, Social-Informatics and Telecommunications Engineering, LNICST. Vol. 100. Springer Verlag, 2014. 79–89. « Unmanned Stores Embraced by Chinese: Are They the Future Shops ?